Landslide......DO NOT GO HERE ALONE till your level 7 or above or unless you are one hell of a good warrior! 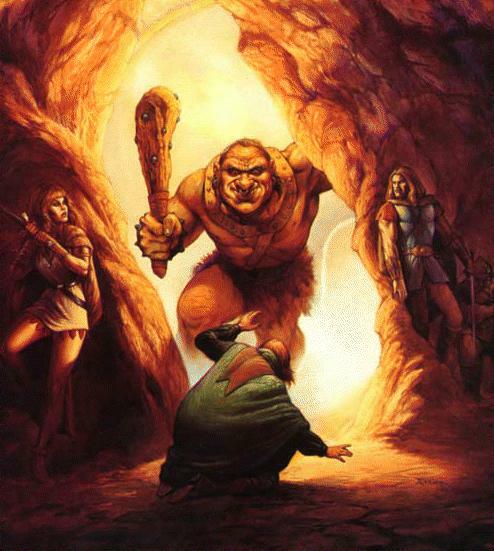 Landslide is guarded by Hill Giants, Hugh Ogres,Earth Giants, Ettins and Griffins to name a few. So why the game makers would put one of the better stores of the game in here,I guess in some warped sort of way, they love to watch us lower characters running around like cockroaches in a room full of big footed giants. The alloy store is located in the second level of landslide. For you players that do not have a high enough perception score yet, you will not be able to see the entrance to the alloy cave. So trust me, once you get to the point I have marked on the map just type ENTER CAVE. Be warned though, bring LOTS of money, because nothing is cheap here and they dont take American Express! And one more thing, dont ever try entering the opening in landslide until your level 100 or you come with a troop of your clan brothers. I made the mistake of wondering what was on the other side once, as fast as I could blink was about how long I lasted! Many pissed off �monsters are sitting just on the other side giggling with joy waiting for the next fool with the thought "Hmm, I wonder whats in here?". I swear, if you stand at the entrance to the opening long enough you will hear hushed laughter and some giant saying "Shhhhhhh, they will hear ya! ".